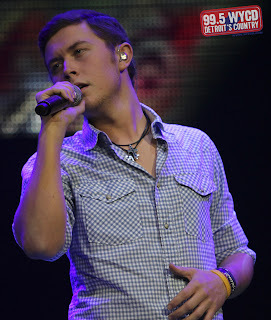 Scotty McCreery - Hmmm ... what's that on Scotty's face? This is a 3 page Biography so I've only posted page 1 on here & provided the link for you to finish reading the article. While Scotty McCreery is learning about American history, the 17-year-old country singer is also busy making some of his own. A week later, he made country music history when his debut single, "I Love You This Big," earned the highest debut for a new artist’s first single on the Billboard Hot Country Songs chart since at least 1984. The song, which hit the Top 20 in seven weeks, is one of the fastest-rising debut singles for a new country artist in history. He’s recording his debut album for Mercury Nashville/19 Recordings/Interscope. He recently made his Grand Ole Opry debut and performed with Josh Turner at Nashville’s LP Field during CMA Music Fest. He’s performed on The Tonight Show with Jay Leno and the Today show. He is currently performing through September with the American Idols Live tour. "I’ve always dreamed of having a career in country music," Scotty says. "I just never thought it could happen. I had never really given myself a chance. Idol gave me the chance and I ran with it. I’m having a good time with it. It’s what I wanted to do and I’m making a career out of it." His debut single, "I Love You This Big," was not only the perfect single to perform for American Idol’s finale moment, but it was a wonderful way to launch his country career. "It just thanks everybody," he says. "You can take it to the fans, to my family or my savior Christ-- ‘I love you this big.’ There are so many ways you can interpret this song, and that’s why I loved it so much, because anyone can relate to it. It fits me well and I hope I’ll be singing it for 30 years." 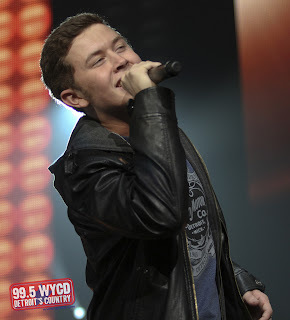 Scotty’s debut album will offer the best of both worlds – traditional country with a contemporary flavor. "My music is obviously country and it has some old influences in it," he says. "I grew up with Hank Williams and Conway Twitty. I listened to other artists like Tim McGraw and Josh Turner too, but I love a contemporary feel with an old soul in it." And that’s exactly how his producer, Mark Bright, describes him. "He is an old soul. It is an incredible thing, that someone that age fully understands what is before him and is completely unaffected by that. I have never seen anything like it in my life. He loves it and he understands the opportunity he’s been given and he wants to work, work, work to take advantage of that opportunity." ILYTB moved up to the #16 spot on Media Base Chart. It will be interesting to see if the release of his video tomorrow will push ILYTB further up the chart. 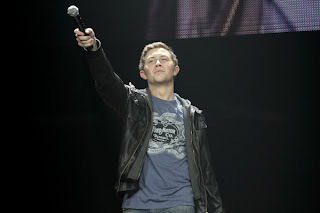 17 19 SCOTTY MCCREERY I Love You This Big - moved up to #17 this week.